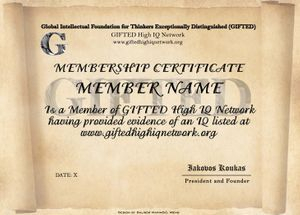 If you wish to be listed in GIFTED High IQ Network, you will have to send us proof of your IQ Scores (such as the IQ test certificates or the score reports along with the links of the latest norms) and/or links to your IQ Societies, IQ Tests and IQ Groups to the following e-mail address: admission@giftediqnetwork.org. You may list one supervised/psychologist IQ test and one unsupervised/high range IQ test with a minimum score of IQ 130 sd15 (second sd above the mean). Only 1st and 2nd attempts are accepted. Online IQ tests with automated scoring which allow multiple submissions are not accepted. 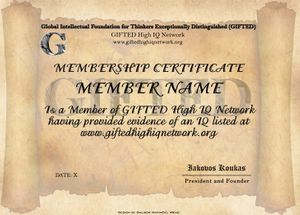 GIFTED High IQ Network reserves the right not to accept IQ scores on tests which do not belong in the list of accepted tests. IQ scores which are proven or probable cases of cheating or cooperation will not be accepted. 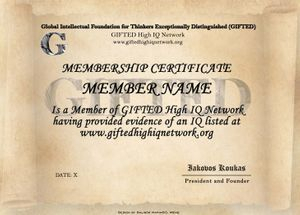 For every new IQ Score listing we will be using the latest norm of the IQ test. This applies to score reports and test certificates which have been issued with older norms. Preliminary norms are not accepted. IQ Scores which have been listed with any official norm will not change in order to follow every updated norm. An IQ Score with underline depicts that the score is the ceiling of the testee's IQ test. The SD column refers to the standard deviations above the statistical mean of the general unselected population, which have been reached by the testees on their IQ tests. The testees' listed web addresses include a link to a website which proves their identity. Our security policy requires verification of your identity, therefore, we will require from all the testees to send us a scanned image or a photo of their ID/passport/driving license having their full name, photo, date of birth and country. 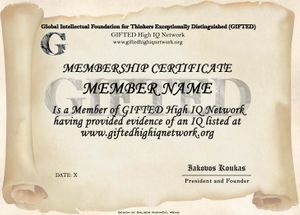 Listing your IQ Scores, IQ Societies, IQ Tests and IQ Groups will require a donation of 10 Euros using the PayPal button. Please read carefully the listing instructions. Rejected and incomplete requests will not be processed or answered. The website content is copyrighted material and you are not allowed to screenshot, archive, store or transmit any part of the website content. You are not allowed to stalk or harass by electronic means any of the GIFTED staff or members. Sending your listing requests and accepting listing clearly suggests and proves your explicit consent. Rules, rights and obligations are explained in a brief and comprehensive way and request only some minutes of reading. Before sending your listing requests, you will have to provide some data for ID verification and fraud prevention purposes: Full name (mandatory), age (optional), nationality (optional), gender (optional) and IQ scores on supervised and/or unsupervised IQ tests (mandatory). Your name and surname must be proven through photo copy of your ID card or driving license or student card or national passport. Every other data on these documents must be covered under your own responsibility. Summary - Disclaimer: Since a listing request is sent, it is taken for granted that you have read all information and instructions stated above and that you proceeded with your own and free will. Since this website offers entertaining services only, it is strongly suggested that one does not request listing in case of doubt or any other personal issue.